Lots of people still can not understand BPMN properly. Here we will introduce some basic knowledge about BPMN for you to get a better understanding about BPMN via a simple example. Business Process Model and Notation (BPMN) is the global standard for process modeling and it is readily understandable by all business stakeholders. More and more organizations are using BPMN and in more and more universities BPMN is taught as a subject. BPMN was originally developed by Business Process Management Initiative (BPMI), which has since merged with the Object Management Group (OMG). The most recent version of BPMN is BPMN2.0, now supported by many tools. However, BPMN1.2 was very popular and most tools are still at BPMN1.2 level. BPMN, which stands for Business Process Model and Notation, is a standard for creating process models and was created in the first decade of the 21st century by a consortium of industry-leading companies such as SAP, Oracle or IDS Scheer. The standard is currently managed by the Object Management Group(OMG) and the latest version of the standard (2.0) is in its final review phases to be published later this year/in early 2011. This diagram below shows a simple process triggered by someone being thirsty. The result is that someone must boil water and wait the boiling water to cool down. After that, someone will drink the warm water and have his or her thirst satisfied. The above BPMN diagram is easy to draw. First, select a start shape from BPMN shapes in the library which is on the left of the canvas. 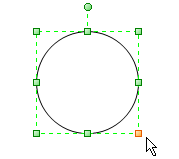 Drag and drop the start shape on the draw page, then select the start shape. From "Line" option, change the color of the start shape. Resize the start shape, drag the control point to the size you want. To keep the same proportions, hold the Shift key down while you drag. Repeat the first step to select three task shapes and two intermediate shapes and resize them to the size you need. Arrange the BPMN shapes in order. 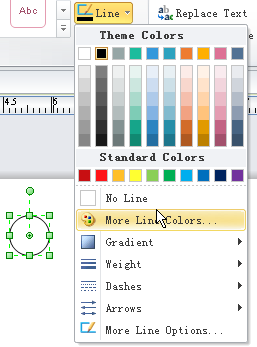 Change the color of these BPMN shapes. Specifically, to change the colors of the intermediate shapes, you may need to click the shapes for two or three times once. Double click the start shape and type the words in the text box. Repeat the above step and type the words in the rest shapes. Using "Connector" tool to select the BPMN shapes.